This content was produced by The Foundry @ Meredith Corp. Fortune editorial staff was not involved in its creation or production. Across every industry, companies are integrating digital technologies into their operations to produce better business value and outcomes. Yet digital transformations involve much more than replacing systems. Leading enterprises understand success also means enterprise-wide transformation—technologically, culturally and operationally—to become information-centric with the right digital tools and talent to succeed, compete and grow. Today, almost every company has a set of digital projects that are underway. And some are now taking the next step, taking those solutions and scaling them on an enterprise-wide basis to satisfy the expectations of information consumers. And to transform effectively, you need to implement and integrate these digital solutions and capabilities scale across the enterprise. The evolution to digital is dependent on an organization’s ability to collect, compile and analyze vast amounts of data, while simultaneously reorienting longstanding business processes. In addition to meeting integration challenges, companies must transition existing IT infrastructures, scale these new technologies and digital platforms across the enterprise and initiate a radical shift in workplace skills and culture. Innovative approaches that include enterprise-wide collaborations, agile development and predictive processes enhance digital businesses. But whether they started early or came late to digital, 60% of all enterprises will have implemented comprehensive digital adoptions by next year1, according to the research firm International Data Corp. The benefits of undertaking this technological makeover are undeniable. By succeeding in their digital makeovers, organizations that were formerly dependent on traditional IT infrastructures and processes can now go head-to-head with the competition, using their information and scale to outpace their rivals and achieve better outcomes. In the past, technology decisions were primarily the domain of IT departments and the CIO. Today, operations, marketing and lines of business regularly determine the course of digital adoptions. These stakeholders understand that focusing on the effective use of data is key to achieving successful business outcomes. Once a company becomes information-centered, it can incorporate digital tools like cloud resources and predictive analytics into workflows. This gives a company a better chance of making the right business decision and the ability to do things more quickly, accurately and securely—key considerations in the midst of volatile and changing business conditions. Meanwhile, employees benefit from increased digital collaborations, access to innovative technologies and more opportunities for creativity and productivity. To cite one example of the impact digital makeovers are having, so-called predictive insights are generating new outcomes across every business sector. 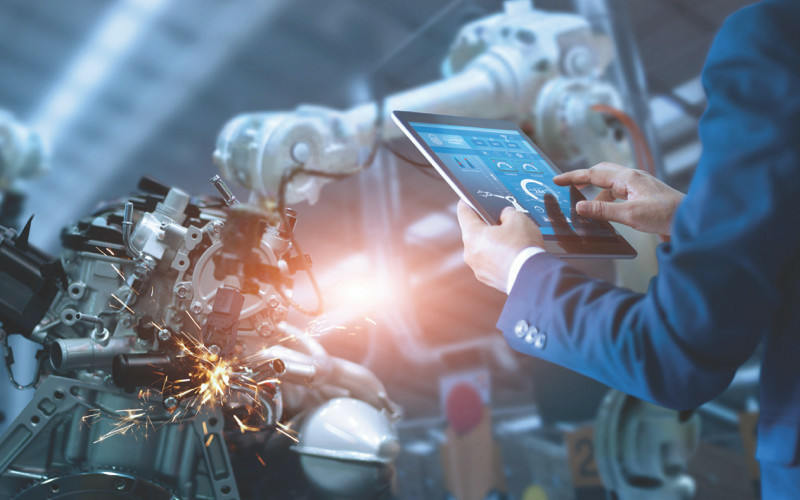 In manufacturing, companies are integrating the Industrial Internet of Things (IoT) and digital twin technology to create smart products and improve performance using continual data input. In heavy construction and the field service sectors, companies rely on the constant flow of information to manage remote assets, prevent equipment failures and increase productivity. In aviation, airline companies employ digital tools to monitor hardware and schedule repairs, which extends equipment life and reduces flight delays. As an organization moves toward greater digital skills and fluency, it must figure out how to bridge the divide between its traditional environments and its newly introduced digital technologies. To create a modern infrastructure that will support a range of data sites and workloads, a significant percentage of companies are supplementing their mainstream IT systems with what’s called hyper-converged infrastructure deployed as self-service private clouds. In fact, Gartner Research predicts that 20% of business-critical applications deployed on legacy IT infrastructure will have transitioned to hyper-converged infrastructure by the end of 20192. Companies then typically add public cloud services (SaaS, IaaS, PaaS) to further expand their capabilities and capacity. At the same time, business executives and technology specialists are recognizing the advantages of turning to third-party managed service providers that offer digital expertise and guidance to help clients become information-centered businesses. Whether it’s a healthcare business dealing with complex patient information, a pharmaceutical enterprise delivering drug therapies, a car manufacturer using data to improve auto designs, or an insurer or a financial services firm managing risk, these organizations must be able to link their technologies and scale as necessary. In an effort to become more information-centric and nimble, organizations across every industry are developing digital strategies to stay current and lead in a rapidly changing business landscape. These technological makeovers are changing business processes and offering capabilities that enable established companies to compete in the digital world. But success also hinges on executive buy-in, whereby management spearheads innovation while also promoting cross-organizational collaborations. A roadmap with clear, incremental objectives is key to a successful digital transformation. Without it, executives and IT leaders can be overwhelmed by the number of technology options. In many instances, a services integrator that is also a managed services provider helps companies navigate the digital transition. They must have the experience in managing and modernizing their existing IT estate, and create the savings that will enable the enterprise to invest in and pay for their digital transformations. For more information, please visit Digital Directions.